Meet the Recording Engineer | Real Drum Track Now! 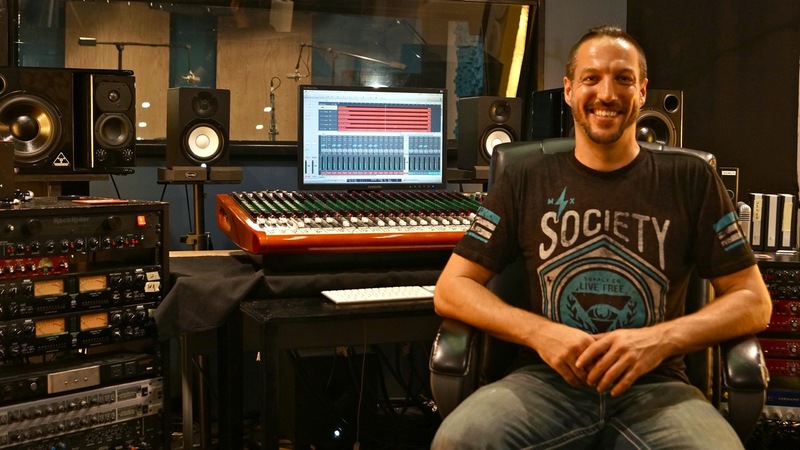 Producer Charlie Waymire’s much touted talent for creating exceptional drum sounds is hardly a surprise, it comes from more than 15 years of experience as a successful drummer, recording artist, studio owner and tech whiz. His ability to create sounds that excite and motivate drummers and artists has made him LA’s new drum recording guru. His diverse drumming career ranges from television dates for “Malcolm in the Middle” (FOX), “Help You Help Me” (ABC) and “Zeke and Luther” (Disney), to albums with guitar great Jeff Kollman and as a successful recording artist with his band “Speak No Evil” (Universal Records). Sparked by his love of the drums, his passion for recording and his oft frustration with the drum sounds he was getting though other engineers he embarked on a multi year journey to fully understand how to create and contour sound. With hundreds of hours of research, experimentation and implementation behind him, studying every book and manual available concerning the science of sound, Charlie took on the daunting task of building his own drum friendly recording studio where he could create the drum sounds he had always envisioned. That studio is Ultimate Studios, Inc and it has quickly become the “go to” hub for drummers of all styles including Ray Luzier (Korn), Josh Freese (Perfect Circle), Benny Rogers II (Mariah Carey), J.R. Robinson (Michael Jackson), Glen Sobel (Alice Cooper), and many others. Charlie’s knowledge and passion for the science of sound lead to the creation of the successful and innovation instructional webzine FullOnDrums.com that offers free video lesson dedicated to the art of recording. Offering demonstrations of various micing techniques, proper mic combinations for successful recording of various instruments as well as insights in mic pre qualities, blah blah blaha. His immersion into the quest for the perfect gear has brought a wealth of manufacturers to Charlie’s door to test and qualify their equipment including, AudioTechnica, MXL, Toft Audio, Joe Meek, Golden Age Project, and many more. Pingback: Ultimate Studios, Inc – Recording/Mixing/Mastering/Drums/Video - Mike Avenaim & Sun Rai Live @ Ultimate Studios, Inc!